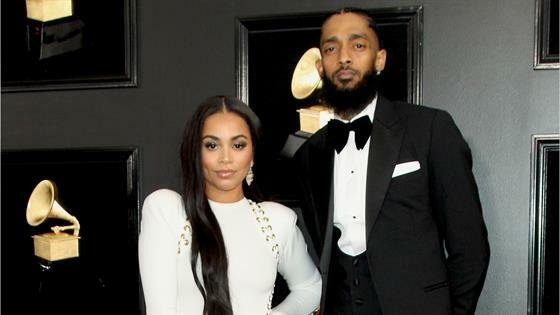 Nipsey Hussle's family is finding peace a week after his death. In a new interview with the Los Angeles Times, the loved ones of the famed rapper, whose birth name is Ermias Joseph Asghedom, are revealing how they are feeling over a week after his unexpected death. His girlfriend, Lauren London, continues to mourn his death, but tells the publication, "I'm going to keep my head high and always represent for my king to the fullest." She adds that she will always remember the rapper, who she dated for nearly six years, as the most upstanding man. "He was a protector and wanted us to be our best at all times," Lauren says. "He was a truth seeker and truth speaker... He loved his kids. He was a family man. His family came first." "[God] sent him to send a message. It looks like, ‘Your time is up because you have completed what I sent you to do.' We all have a plan, but God has his own plan," his father, Dawit Asghedom, adds. "So he had completed what he needed to be doing and he did it early so [God] probably want to take him early too." While the star's murder has gripped the public, his mother says she wants Ermias to be remembered as a "humble, spirited, respectful man who had, since his childhood, had an extraordinary and unlimited intellectual capacity," rather than a victim. And even though one would expect the family to be angry over his death, they are instead encouraging mourners to remember the rapper's lyrics about letting love "bring us together." His father says, "It was like he was sent by God to give some love to bring us together because that's what his lyrics were saying, always." Likewise, his brother Samiel Asghedom is remembering the artist for his ability to bring people together. "There's a lot of politics within the area that we grew up in, but he stayed the course and showed what he was about," Samiel shares. "He made something work in an area that was run-down, that people were scared to come to, and he turned it into a landmark."